Here's how to avoid shingles and how to ease the discomfort if you get this painful rash caused by the herpes zoster virus. Shingles pain commonly takes the form of stabbing, burning, and itching, and you’ll notice it before the shingles rash appears. If you’re noticing a burning, tingling sensation across the skin of your torso, it’s possible you may have shingles. About one in three Americans develop shingles at some point in their lifetime; the condition hits people who have suffered chickenpox, and your shingles risk increases as you get older simply because the immune system tends to weaken with age (a phenomenon known as immunosenescence). The link between shingles and chickenpox is due to the fact the shingles virus—called herpes zoster—is the same virus that causes chickenpox. Most of us develop chickenpox in childhood, but after the condition clears up, the herpes zoster virus goes into a dormant state deep in the nervous system. But the dormant virus can re-activate in the spinal nerve fibers that lead to the skin, and cause shingles. 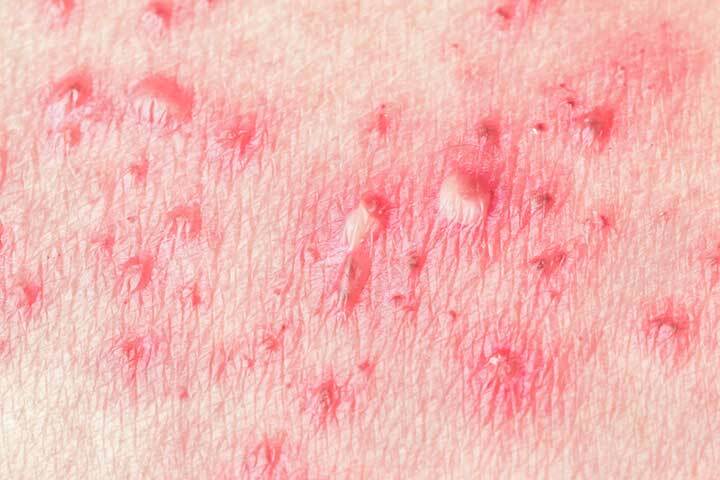 The blistering rash that results tends to occur most often in the torso area—in fact, the “zoster” in herpes zoster means “belt” or “girdle” in Greek. Besides seniors with poor immunity due to age, people who have medical conditions that weaken the immune system are vulnerable to shingles—examples include leukemia, and human immunodeficiency virus (HIV). So are people who take immunosuppressive drugs, such as steroids. If you’re over 50 and haven’t had shingles, experts recommend a vaccination. A new vaccine, Shingrix, is proving to be effective (more on that in a minute). Shingles pain commonly takes the form of stabbing, burning, and itching, and you’ll notice it before the shingles rash appears. The rash manifests as fluid-filled blisters that burst, crust over, and heal across three to four weeks. The pain of shingles can be extreme, though there are ways to relieve it. Conventional approaches to treating shingles include antivirals like acyclovir (Zovirax), valacyclovir (Valtrex), and famciclovir (Famvir), along with pain medications. Your doctor also may prescribe anticonvulsant drugs used to treat seizure disorders, such as pregabalin (Lyrica). These drugs stabilize abnormal electrical activity along the affected nerves. Call your doctor immediately if you have pain, tingling, and itching on one side of your body or face and have had chicken pox. Antivirals need to be started within 72 hours to help alleviate symptoms. Let your doctor know if the pain and rash occur on your face, or you develop swollen, painful, and red eyes and eyelids. It’s rare, but shingles can lead to permanent eye damage. Alert your doctor to tinnitus (ringing in the ears), vertigo (dizziness), facial numbness, or deafness. These conditions may indicate the virus has spread to your ears. Keep in mind that shingles is contagious to anyone who hasn’t had chicken pox or been vaccinated against it. Antidepressants also can help make the pain more tolerable by altering levels of key brain chemicals that influence your body’s interpretation of pain. Lidoderm patches are another option: these contain the local anesthetic lidocaine, and can help numb and cool the affected skin once the rash crust over. For doctor-recommended shingles-soothing strategies, check out “Don’t Give in to Shingles” by Rosanne Leipzig, MD, PhD, Vice-Chair of the Brookdale Department of Geriatrics and Adult Development at the Icahn School of Medicine at Mount Sinai. Keep in mind that antivirals need to be taken within 72 hours of symptom onset to be most effective. If you take them inside that window of time, they may speed healing, decrease your discomfort, and help prevent the long-term pain (called postherpetic neuralgia) that can affect many people who develop shingles. Statistics from the Centers for Disease Control and Prevention (CDC) suggest that up to 50 percent of seniors who develop shingles go on to develop postherpetic neuralgia. Postherpetic neuralgia occurs because the shingles virus damages the nerve fibers to the extent that they continue to transmit exaggerated pain signals from the skin to the brain even after shingles has cleared up. Rarely, muscle weakness can result, as the nerves also control movement. Unfortunately, many people who take antivirals do still experience significant discomfort from the shingles rash, and also report postherpetic neuralgia after the rash clears. You might want to consider alternative methods of treating shingles. There is some evidence that high doses of vitamin C may help ease shingles pain, and boosting your intake of zinc if you are deficient in the mineral may decrease your risk of developing postherpetic neuralgia. Acupuncture and the use of topical capsaicin cream may also help—our “Managing Shingles Naturally” post has more information. Getting vaccinated against shingles is your best option for avoiding this painful condition. Until recently there was only one vaccine option: Zostavax, which was approved in 2006. In October 2017, the CDC approved Shingrix, which is given in two doses between two and six months apart. Experts are now recommending Shingrix over the old vaccine, since Shingrix appears to be much more effective than Zostavax. In clinical trials, Shingrix proved 97 percent effective in people aged 50 and older, and 91 percent effective in those aged 70 and older. By comparison, Zostavax is 64 percent effective in people in their 60s, but this drops to about 40 percent in those aged 70 and up, and further decreases to protect only about 18 percent of those aged 80 and older. Besides helping protect you against shingles, the shingles vaccine reduces the risk of developing postherpetic neuralgia—and here, Shingrix is also more effective, cutting the risk by 90 percent in comparison to Zostavax (about 67 percent). The new vaccine also may be an option for people with a compromised immune system, since—unlike Zostavax— it doesn’t contain a live virus. A study presented in the Journal of Infectious Diseases (Feb. 26, 2018) sheds light on why Shingrix is so effective. The study, in looking at 15,000 people who received Shingrix, revealed that the vaccine stimulates the body to produce specific immune memory cells (called CD4 T cells) that generate strong and sustained protection against herpes zoster. Shingrix generated a 24-fold increase in these T cells. If you’ve already had Zostavax, you should still be able to get the Shingrix vaccine—if you are in any doubt, speak with your doctor. antidepressants, brain, brain chemicals, dizziness, ears, immune system, immunity, leukemia, medical conditions, memory, muscle, pain, postherpetic neuralgia, report, seizure, Shingles, shingles pain, Shingles vaccine, skin, tinnitus, vertigo, virus, vitamin, vitamin c, zinc. I am perplexed….if I am already taking 1000mg of Valacyclovir, would I also need the shingles vaccine? If so, what is (if any) the reactions between the two medicines? I am a 81 year old Caucasian in my 3rd week of Shingles -Valtrex tid for 1 week and Neuron tin 100 mg- is the vaccine recommended and when to get it? I had shingles on right quadrant of face which included a lesion in cornea. After maintaining a several months long treatment plan the eye was under control but had to be monitored on a monthly basis. 15 years later it had a dramatic change wherein the spot started melting in the cornea. A stem cell implant was done which looked all okay for 3 weeks and then the implant melted. Coming within 3 days of doing a surgical procedure which would have left me blind in that eye and looking grotesque … a thin skin grew over the “divot”. I am stable but only repairing the “divot” very slowly after 6 years. MY QUESTION: should I have the vaccine ? I do not want to do anything that could possibly cause trauma and disturb the shaky balance going on. I had the shingles about 4 or so years ago. Do I still need to get the vaccine? Too many diseases have been created for massive profits. The love of $$$ is the root of ALL evil, and massive worldwide DESTRUCTION. Nobody can take it with them when they drop DEAD!!! Please provide info on contact prevention once rash appears & antiviral treatment started..airplane & train & bus travel..being around children & pregnant women etc. I currently have a mild case of shingles. I took the antiviral drugs at the start. My question is, is it OK to get the shingles shots now? I have shingles,the rash is gone, there is still some pain, not bad. Can I get the shingles shots now?